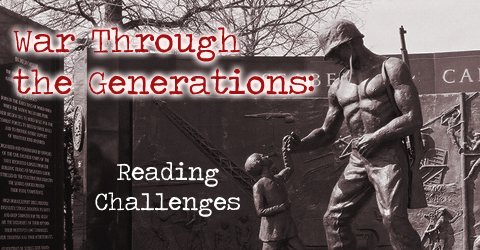 The Guernsey Literary and Potato Peel Pie Society by Mary Ann Shaffer and Annie Barrows is by far the most popular book among WWII reading challenge participants. Here are excerpts from more reviews; click the links to read their complete thoughts. The authors do not creep past the reality that we do not live in a black and white existence. They boldly show how the islanders, even though devastated by the circumstances of war, could still befriend some of the German soldiers that occupied their homeland. Shaffer and Barrows revealed the devastation and starvation that occurred to the town people, the servants, and eventually the soldiers. When one scene showed a soldier committing a horrific act, an alternating page might show a German soldier with compassion, sneaking medicine to help a sickly islander. I thought it would be difficult to follow a story told in letters, but it wasn’t. 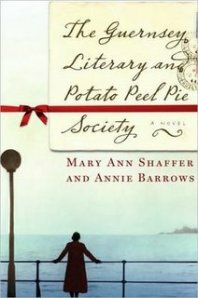 The Guernsey Literary and Potato Peel Pie Society by Mary Ann Shaffer and Annie Barrows is, hands down, the most popular book among WWII reading challenge participants. Here is the latest round of reviews; to read an entire review, just click the link. Overall, it’s a good, fun, read, especially for lovers of Brit lit. The Guernsey Literary and Potato Peel Pie Society is about how books can change lives and how people can impact one another’s lives. In all honesty, I must admit that it didn’t grab me right away. It took me more than three weeks to get past the first 75 pages. I’d pick it up, read a bit, put it down again. When I picked it up I couldn’t remember anything that was going on or who in the world these people are. And there were a lot of people! The book is told in letters and by the books end there would be about twenty different voices. Once I got past the rocky start, I really enjoyed this book. I loved everything about this one. The setting. The characters. The language and style. I felt Juliet to be a kindred spirit. I loved the way she talked about books as friends. That reading was something she was so passionate about. That making connections was so important to her. That friendships matter. There was something so charming about this one. I love books that teach me things I didn’t know but that are still entertaining. This book seems light and fun most of the time but there is an undercurrent of sadness and horror due to the German occupation of Guernsey and WWII itself. I learned SO MUCH from this book! I didn’t know about the German occupation of the island, the Polish slave labor sent there, the fact that the island remained occupied even after D-Day …. And there are little things as well, things I’d never considered before. Like what did women in concentration camps due when they menstruated (before starvation stopped it)? That tidbit of info horrified me even more because it was something I simply never considered before. Thought this was a great book about love and friendship. …do know that The Guernsey Literary and Potato Peel Pie Society was a quick read that I enjoyed. I appreciated the distance the format provided, and the many voices that combined to form a complete picture of life on Guernsey during, and in the years immediately following, the German occupation. Although dealing with a topic like WWII and the suffering that the people went through in this time, it is told in a lighthearted and humane way so as to make the book very enjoyable to read. I really didn’t want this book to end, but I was pleased with how it ended as I am a sucker for happy endings. Seriously though who doesn’t love one? However I must mention that if you are looking for an in-depth book about the German Occupation in Guernsey, this is not it. One of the amazing features of the book is how it shows simple people with no training in the classics grappling to understand them AND SUCCEEDING. Overall an informative novel of life in wartime Guernsey. The characters in Guernsey are beyond real; they truly come alive before the reader’s eyes. Rarely do I read a book and find myself thinking of the characters as if they actually ARE real people, and while reading Guernsey I became so lost in the story, so lost in the characters’ lives, that I would honestly forget that the story was entirely a work of fiction. I loved it! Not only was it a so called “heart warming” story, but I learned a lot about a place and event that I’d never heard of before. I wasn’t expecting the epistolary style, and was originally a bit put off by the format. However, as the story progressed, I began to enjoy it. That is, until more and more characters were added to the correspondence and it became increasingly obvious that all the characters sound the same. Sure, they all have their quirks, but without the “From John Booker to Juliet” headers above each letter, I would have been forced to flip to the end of the letter and see who had written the letter to keep things straight. The letters were beautifully written, and they flowed seamlessly from one to another. Each letter was written in the distinctive voice of a single character, yet put together, they created a rich picture of loss, survival, and joy experienced by the people of Guernsey under Nazi rule. This beautiful book by Mary Ann Shaffer and Annie Barrows is definitely one of favorite books of the year. I wondered about it because it’s received so many fantastic reviews and I hate when there’s that much hype about a book and then I hate it… but this one is beautiful and touching and interesting and really, really deserves all the praise. I loved it. I fell in love with the characters and place. I would happinly go live in that book. Some of the events described in the islanders letters are pretty grim. The starvation, the oppression and almost total abandonment by England are tough to read, but the sense of community that the islanders developed is inspiring, and although this is fiction, the events are not, and it is easy to imagine a small island pulling together like this. It’s a story of surviving a war and putting your life back together afterward. It’s about the thrill of new friendships and the joy of old ones. It’s about finding the beauty in a horrible situation and the people we meet that change the way we live our lives. And don’t forget to check out Shelley’s seven-word review at ChainReading! I had heard so many great things about this book that it made me nervous. I approached this book with trepidation because I was certain that it couldn’t live up to the many rave reviews, and that it would be sure to leave me disappointed. To my surprise, not only did it exceed my expectations, but it will now have a permanent place in my library as one of my favorite reads of all time. In this novel, Shaffer and Barrows tell a story of chance encounters and destiny through letters mailed mainly between Juliet Ashton, a British author, and several citizens of Guernsey in the Channel Islands. Relationships that begin as a fluke when Dawsey Adams finds Juliet’s contact information in a book by Charles Lamb grow to change the lives of not only Juliet, but many of the islands residents as well. You never know what life has planned for you, but if you are open to any and all possibilities, it often leads to a deeper happiness than you ever imagined. We are in London in the year 1946. The war just over, the world is struggling to find its footing again. Juliet Ashton is a young woman who has just hit it big with a recently published book, and she is looking for a new muse for her next project. Serendipitously, she received a letter from a Mr. Dawsey Adams, a native of Guernsey, one of England’s channel islands. Mr. Adams has come to possess a used book written by Charles Lamb, which he is quite taken with, and Juliet’s name and address is written on the inside of the front cover. How did it find its way from London to Guernsey? Since there are no bookstores in operation currently in Guernsey, could Juliet give him the name and address of one in London where he could order more books by this author? Juliet and Dawsey begin corresponding, finding much in common, and a wonderful tale unfolds.